The language of Fyodor Dostoyevsky, Leo Tolstoy, Alexander Pushkin, Anna Akhmatova, Vladimir Vysotsky, and many other brilliant classical and contemporary writers. This is the national language of the largest country in the world – Russia, and also other countries. About 300 million people speak Russian. It makes it one of the top five most widely spoken languages in the world. Russian - one of the official languages of the UNO and many other international organisations. The knowledge of Russian opens up new opportunities for those who want to find a prestigious and challenging job, participate in cultural and scientific projects or do business with or in a country with great economic potential and prospects for investment. You'll need to learn Russian if you plan to visit Moscow, St Petersburg, plan a jouney on the Trans-Siberian Railway (possibly to Vladivostok) if you are going to admire the beauty of the Altai and Lake Baikal, the unique and inspiring Russian architecture, if you get to know Russian art and endeavour to understand the Russian soul. Knowing Russian will help to eradicate language barriers for tourists and enable them to understand everything while in this great country. "Charles V, the Holy Roman Emperor, used to say that the Spanish language is for God, French - for friends, German - for enemies, Italian - is appropriate for women. But if he were skilful in the Russian language, of course, he would add that it was appropriate for all of them, because he would find in it the splendor of Spanish, the vivacity of French, the strength of German, the delicacy of Italian, besides the wealth and strength in expressions from Greek and Latin languages." 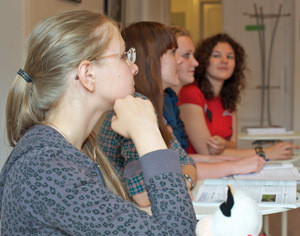 The International O'key Language School is launching Russian language courses in Prague! Each level is divided into several steps for your convenience and you can start studying the Russian language anytime after the entry test! Save your time and money by joining the existing group if your level of language proficiency allows you to do that! The courses are based on the communicative approach, which is aimed at mastering all key language skills and has a special focus on the practical usage of a language. The number of students in each group is limited to 4-8 people to make learning more effective. The International O’key Language School also offers additional Russian language programs. The grammar course – the main focus of the course is mastering students accuracy of speach. It is suitable for those who want to learn and perfect their knowledge of Russian grammar. This course is for the students with the elementary level and above. The course for travelers - Russian language course for those who want to overcome the language barrier when traveling abroad and learn to communicate freely in typical daily situations such as getting acquainted with new people, planning a trip around the city, asking for directions, talking to a waiter in a restaurant, etc. The course is designed for those who just start studying Russian or are at the elementary – pre-intermediate levels. Conversational course helps to develop speaking fluency and perfect listening skills. It is suitable for student sof any level starting from elementary. Business course – The Business Russian course is designed for those who require the knowledge of the language for their work. The minimum language requirement is intermediate level (B1, CEFR). Individual studies of Russian present tailor-made courses for those who cannot study in a group due to various reasons. You build up the time-table yourself! Online Russian courses. If you want to learn the language but do not have enough time, or if you are too located too far from the school office to attend classes there or simply if you want to have classes with a native speaker but fail to find one, take an online Russian language course! For online studies to start, check that you have a computer with an Internet connection, Skype, a microphone and headphones. Classes can be taken individually or in a pair with another student. The International O'key Language School welcomes kids of different ages at our Russian language courses for children. The lessons are organised in accordance with the age peculiarities of the young learners. The main type of activity is game playing. Children enjoy thrilling adventures the teacher takes them on during the class and at the same time pick up the new language without even noticing it! The classes can be started from the age of 3 years old. What do you know about Russian? The Russian language belongs to the group of East Slavic languages, along with Ukrainian and Belorussian. One of its special features is the use of the Cyrillic alphabet, which dates back to the ancient Greek alphabet. The Russian alphabet consists of 33 letters: 21 consonants, 10 vowels, and two silent letters - the soft sign ь and the hard sign ъ. At the same time, one of its most characteristic features is the reduction of unstressed sounds - you need to save energy while speaking, due to Russian cold winters. Also worth mentioning is the system of cases and verb conjugations with different endings and word stress that does what it pleases. The word order is also strictly fixed. Because of this, learning Russian is difficult, but interesting. Hello! Hi! Добрый день! Привет! Dobryĭ denʹ! Privet! How are you? Как дела? Kak dela? Bon Appetit! Приятного аппетита! Priyatnogo appetita! Goodbye! До свидания! Do svidaniya!